Are you a vegan and want to try a new recipe using tempeh? You are in luck! Read on to learn how to make this delicious tempeh recipe. It’s flexible and works for breakfast, lunch or dinner. This recipe is super quick, easy and affordable. Tempeh is one of my favorite plant-based protein sources. It’s type of flavorful, fermented soy beans and it’s very filling. I usually use one tempeh package to serve 2 people. My local Trader’s Joe sell tempeh for around $1.99 and it’s organic! For this recipe, I use coconut and hemp oil to stir fry tempeh and vegetables. Coconut oil, unlike other vegetable oils is very stable when heated and does not create toxic byproducts. So it is a much better choice for stir fry. Don’t forget to break apart the tempeh with your hands before cooking. This recipe has little preparation because the tempeh package I purchased from the store is pre cooked. So please adjust your time according to the packaging. The benefits are too long to list, I wish I had been eating this vegetable my whole life! Heat the coconut oil in a frying pan. Add onion and garlic, cook until they turn yellow and add broken tempeh. Cook for about 2 minutes and add vegetable broth, turmeric, curry powder. I think this is a very interesting combination! I like using greens in egg omelets sometimes and find it adds a little flavor and crunch. I’m so hungry right now. This looks so good. I have to make this tomorrow. So I feel embarrassed that I don’t even kno=w what tempeh is lol. Thanks to Google, now I know. That looks so delicious! I have to try this Tempeh thing. I have been looking for alternative protein sources and this may just be it. Wish me luck in my journey of finding tempeh. Most asian markets carry tempeh. You can also find tempeh at Trader’s Joe, Wholefoods or Jimbos. What a great way to start the day. It sounds delicious to me. This sound good I have not heard of Tempeh until now. I would like to try it sometime. Thanks for the recipe. Looks incredibly healthy. Is there a lot of prtoein in Tempeh? 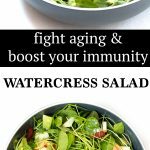 I have never try Tempeh or watercress…your recipe looks doable must try this health meal. This is definitely new to me! I am curious enough, though, to give it a taste test. Yum! I love watercress in my stir fry, but I’ve never tried it like this before! How yummy is this! I need a new healthy recipe! I love watercress, and tempeh is so good for you!